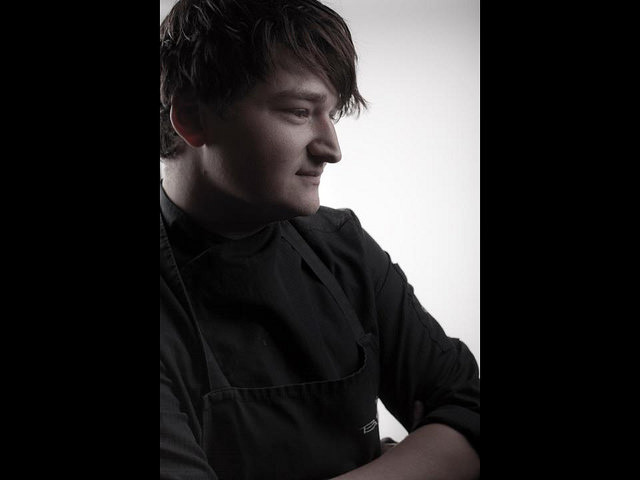 Benjamin Peifer is a talented young chef in Germany. 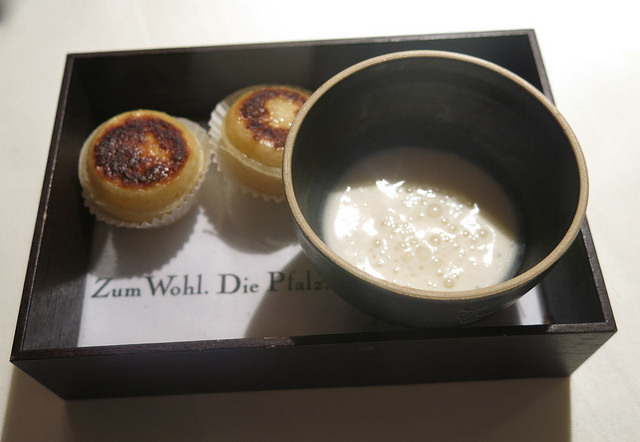 Our visit to restaurant Urgestein where he serves contemporary cuisine in an authentic atmosphere was one of the most surprising culinary events of the year. After training as a baker, Chef Benjamin Peifer began his culinary travel to become one of the best young Michelin star chefs of Germany. 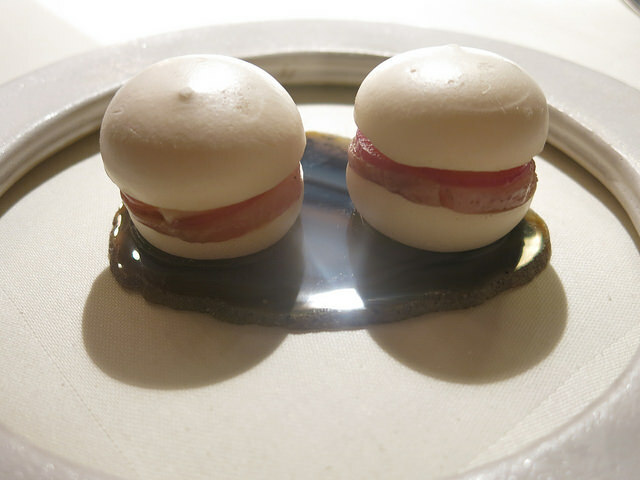 He gained experience in restaurant The Swan, Freundstück, Erfort, Amador and Hofgut Ruppertsberg where he became chef. After only a year and at a young age of 23, he was awarded as Discovery of the Year 2010 in the German gourmet guide Gusto. After moving to restaurant Urgestein in 2012 he received the year after the first Michelin star for the restaurant in the Steinhäuser Hof. 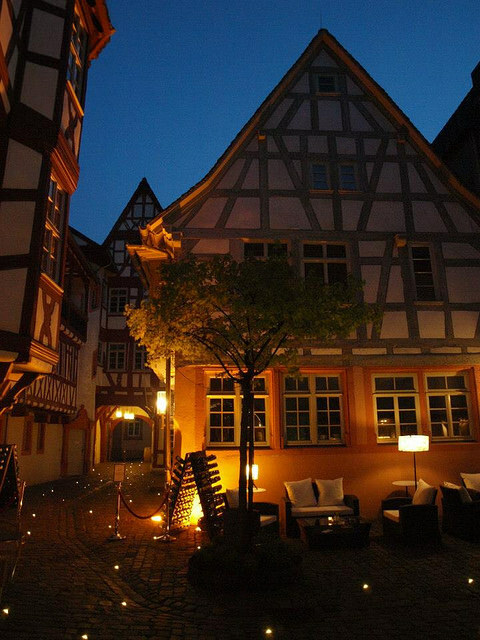 The restaurant is located in a stone house which is part of hotel Steinhäuser Hof and located very central in the picturesque town Neustadt an der Weinstrasse. 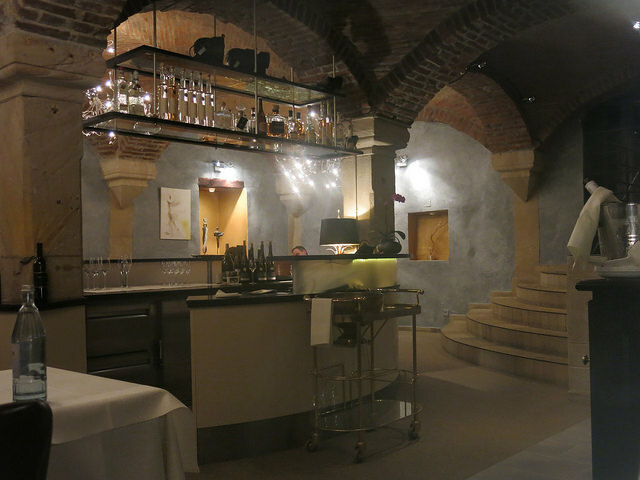 With its location in the middle of the Pfalz wine region it is a perfect stop for culinary and wine travels. The monumental stone house farm in a pedestrian area has been restored in its authentic style and has a beautiful and cosy courtyard. The restaurant itself is located in the former stables of the farm. The interior has some medieval charm, it is combined with some modern features but could still use some design changes. 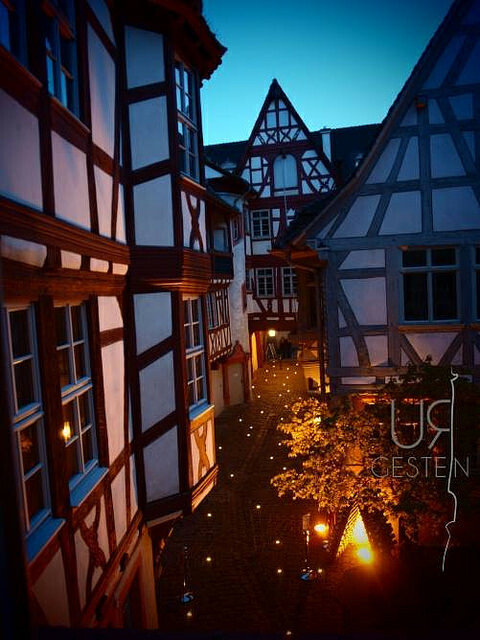 ‘Urgestein’ or primal rock finds its name as being in the oldest building of the town. 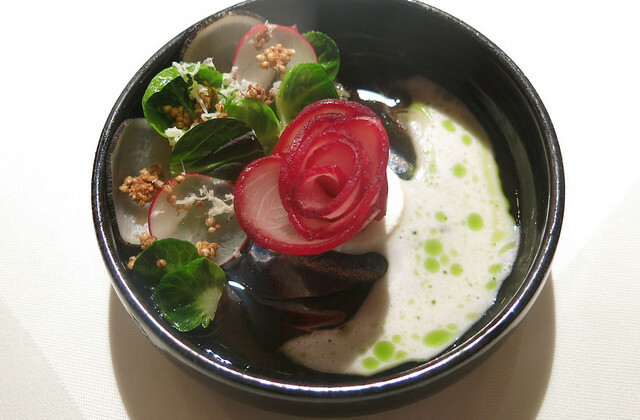 Hotel and restaurant owner Hanno Rink presents an interesting tasting menu in 5-courses (100€), 6-courses (120€) or alternative a 4-course vegetarian Grundstein menu (85€). 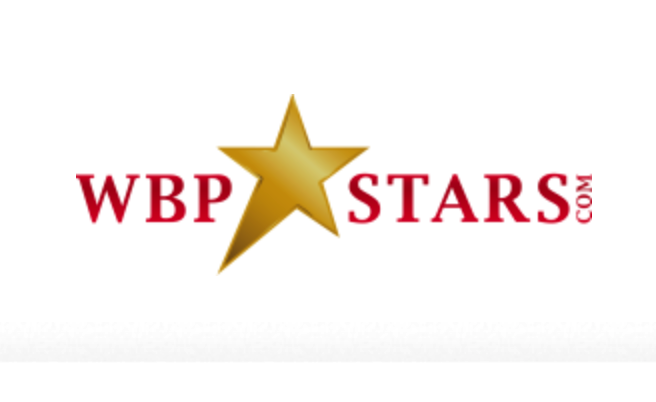 Throughout the menu regional products and flavours of the Pfalz area are innovatively combined with international ingredients. The wine list and the wines served by sommelier Idil Tanel reflect the best of German wines with a focus on the Rheinland-Pfalz area. 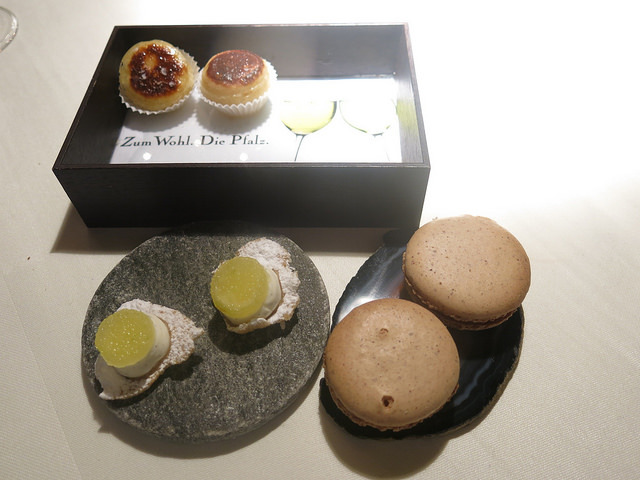 We start our dinner with a Riesling Sekt brut from Weingut Corbet while a menu with appetizers is presented as ‘Die Küche grüßt im Namen der Pfalz’. 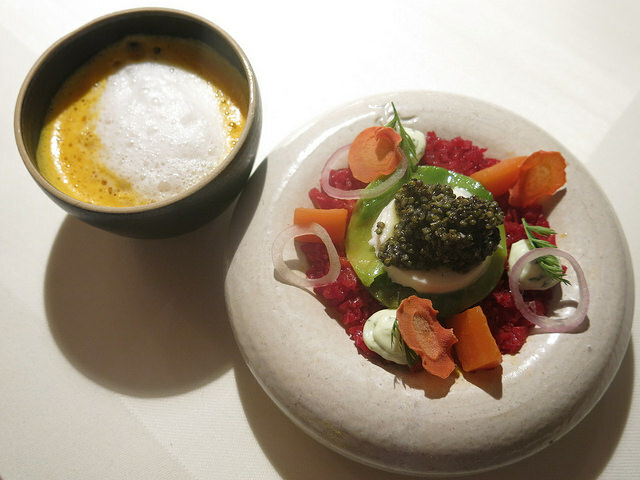 As a first course one plate has a flan of potato & carrot with a fresh tartar made of red carrots, avocado, horseradish and caviar of seeds. 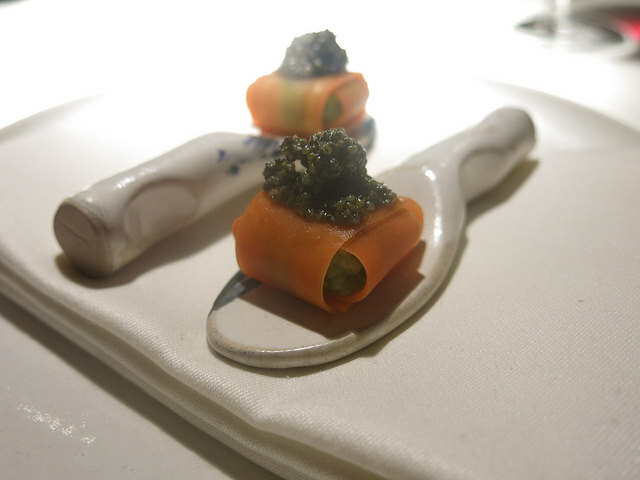 Next to it a bowl soup of fermented potatoes and a spoon of carrot filled with avocado and topped with caviar made from seeds. 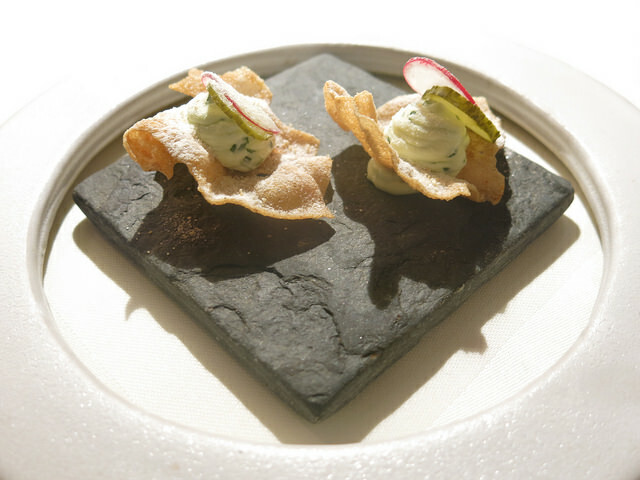 This dish is paired with a glass Sauvignon blanc 2012 from Oliver Zetes. Showtime with the Hamachi from Japan in a ‘Flora & Fauna Winter Edition’. De last vegetables of the winter beautiful combined with the first vegetables of spring. This original and tasteful dish is served with grapefruit, ponzu, yoghurt mousse, quinoa, and horseradish & grapefruit vinaigrette. 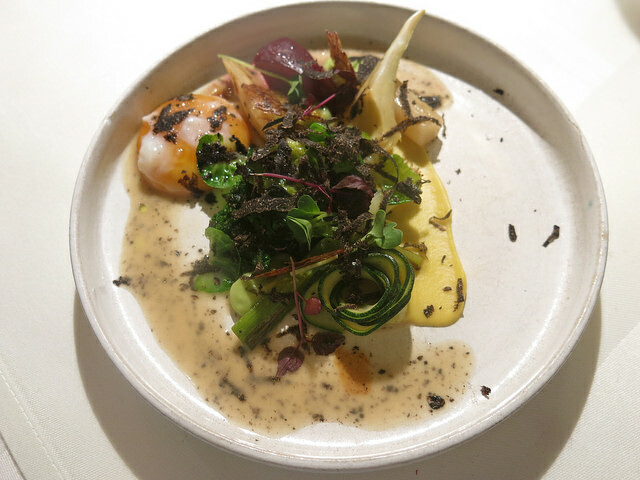 Benjamin is extremely strong in vegetarian dishes and proves his reputation with an excellent next dish: Ein Teller Gemüse. Egg yolk comes with avocado, red and yellow beets, parsley root and Perigord truffle. Matching wine being the Chardonnay Tempus 2013 from Bergdolt. 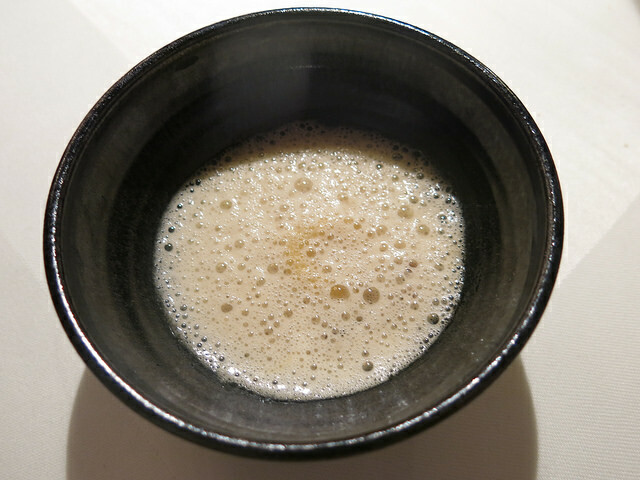 Glazed celeriac ravioli with Parmesan cheese, hazelnut and foam of brown butter. 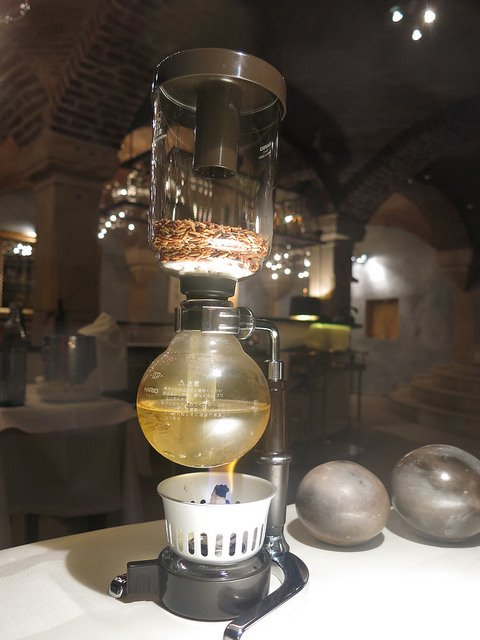 Served with an own cuvée, Winterkirchen Urgestein. As a refreshment the sorbet is replaced by a kalamansi cake with a layer of Aperol. 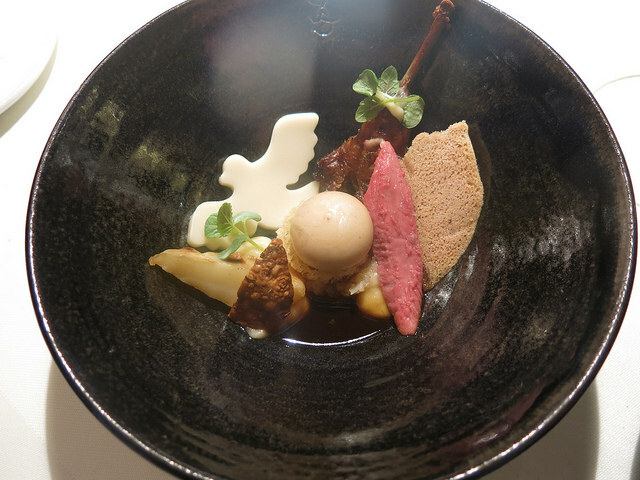 The pigeon from Anjou was baked on carcass and glazed with malt vinegar. Today accompanied with textures of Jerusalem artichoke, sunflower nougat, white onion cream, crumble from the skin of the pigeon and a reduced sauce of pigeon. This very intense and nicely flavoured dish, is followed by a second serving. 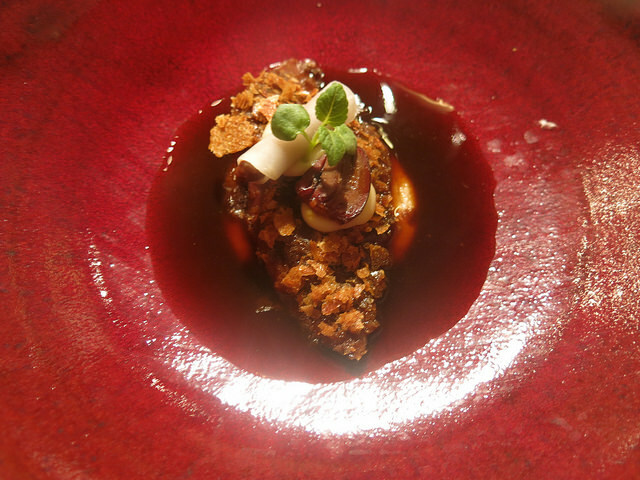 Caramelized pigeon leg with a too soft mousse of foie gras and a jelly of Jerusalem artichoke. 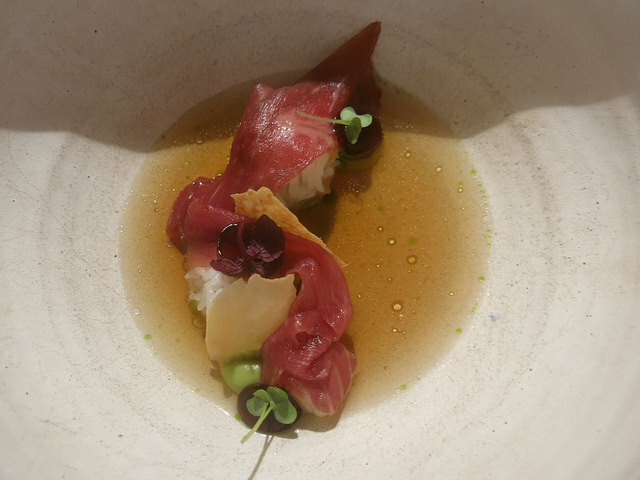 An Asian inspired creation came as ‘Donburi’. Rice with glazed eel was finished with pickled beef, soja, pandan and an infusion of roasted rice. 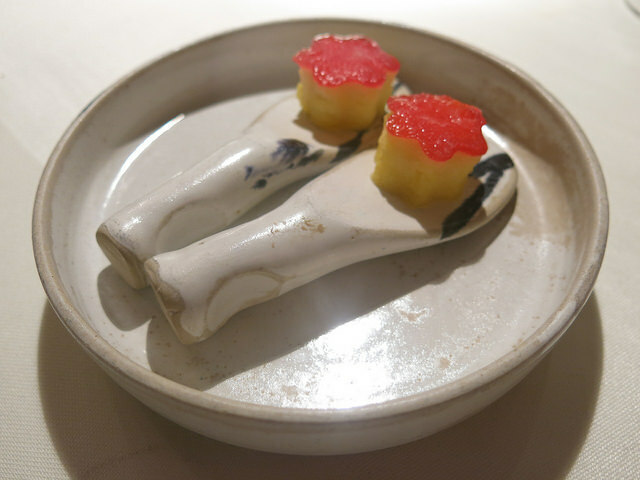 This was an unusual serving after the main course, but very delicious with rich flavours. 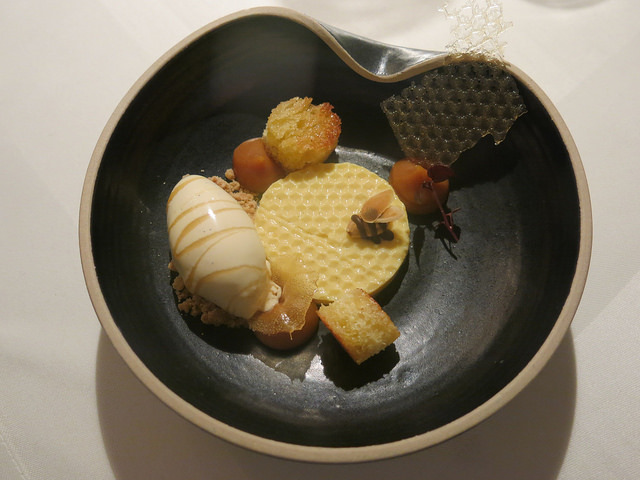 Dessert with vanilla ice cream, a flan of vanilla, caramel and brioche. Our tea is homemade from the flowers and roses of last year and served with several after dinner bites. Today we have met a young chef with an extremely high potential. 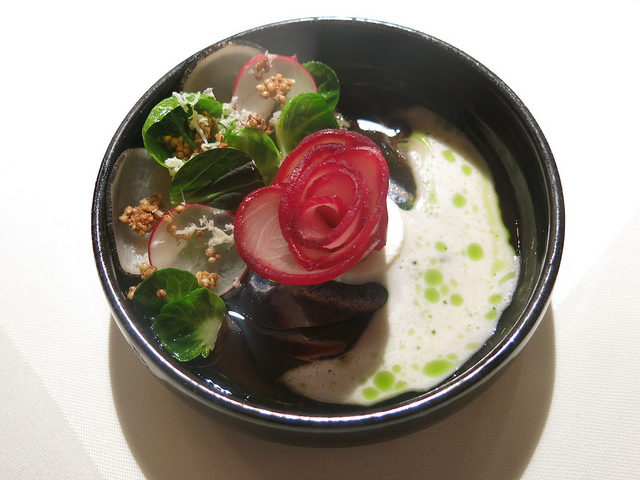 Benjamin Peifer dares to explore and combines local ingredients with Asian touches. 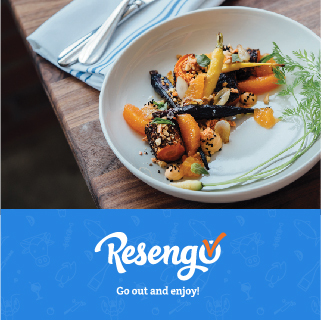 Pure, balanced and fresh dishes made with local vegetables are innovatively twisted. Although the restaurant was not very busy we were impressed by the chef serving this level of tasting menu only with two people in the kitchen. 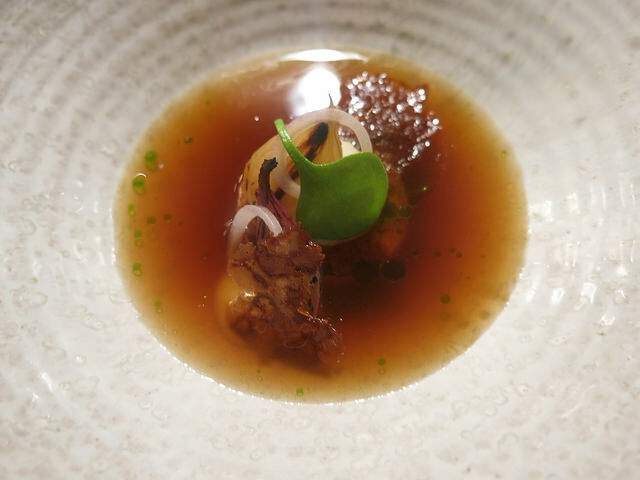 His style of modern contemporary dishes is in contrast with the more classic and authentic interior but he brings character and uniqueness. 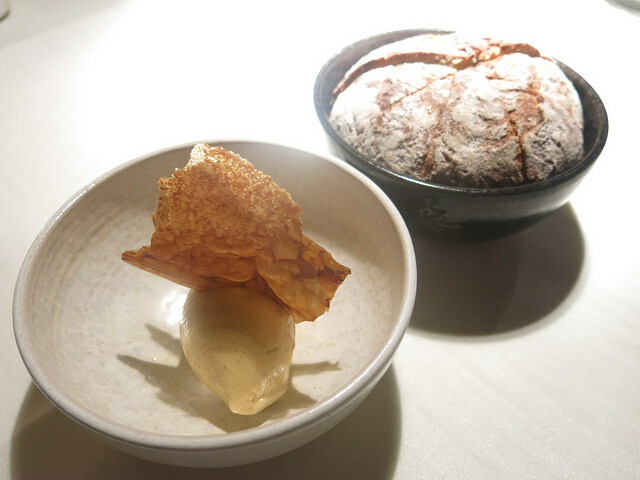 With a bit of fine-tuning in the service and balancing some dishes, we are convinced Urgestein will rock!